In this lesson, students will learn about the effect the industrial revolution had on a variety of art movements. Students will examine innovative paths artists chose to explore after easily accessible photography rendered realistic painting less necessary. Students will learn about the goals of the Cubist art movement and how to discern between Analytic and Synthetic cubism. What will students learn through this lesson? What specific knowledge, skills, and/or attitudes should students gain or develop through this lesson? The students will learn the goals of the artists in the Cubist art movement. The students will learn to discern between Analytic and Synthetic styles of cubism. Students will create their own still-life paintings inspired by the Cubist examples presented in class. Students will examine innovative paths artists chose to explore after easily accessible photography rendered realistic painting less necessary. Students will learn about the goals of the Cubist art movement and how to discern between Analytic and Synthetic cubism. Students will observe two or more still life objects from at least three angles to create a cubist drawing. They will create drawings in which the objects are connected, rather than sit next to each other on the picture plane. Students may choose to add a facial feature or body part for variety and whimsy! Students will observe multiple cubist example paintings as reference to the range of styles possible in the art movement. Step 1: Students will apply the concepts learned in the introduction to cubism into drawing experimentations. They will fill their planning sheet with four ideas for paintings, each including 2 objects drawn from 3 angles. Step 2: Students will choose their most successful sketch and draw it on a sheet of paper matching the size of the canvas to be used. They can then transfer these sketches to their canvas using graphite paper. Graphite lines may be traced over with permanent marker if the lines are helpful to beginner painters. 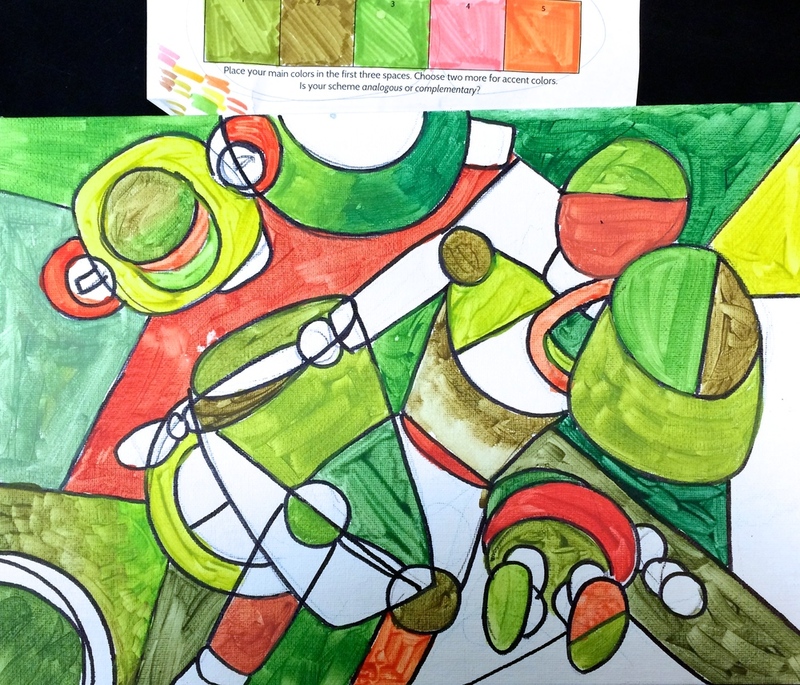 Step 3: Students will choose a color scheme based on the type of cubism they are inspired by. Muted tones and gradients for Analytic cubism, or brighter, saturated, flattened tones for Synthetic cubism. Step 4: Students will paint their canvasses according to their color scheme, working shape by shape. Thinning paint with water for the first layer often helps students create an underpainting, or map of colors to follow with subsequent layers of thicker paint. Step 5: Students may need two to three additional painting sessions to complete their work, depending upon the complexity of designs and size of canvasses. For younger students, smaller canvasses are advised to allow for detailed work without unnecessary fatigue. Students will view the paintings made by the rest of their classmates, and discuss the success, different perspectives on the assignment, and different approaches used. Students will compare the styles of the Cubist artists with Expressionism, Surrealism and Art Deco. The students will participate in a group critique to discuss the successful elements of each finished piece and decide the predominant style influences, Analytic or Synthetic. Students will share thoughts on the process and discuss how this way of seeing might inform their future work. They will discuss how these artworks may have inspired contemporaries of the Cubist art movement.